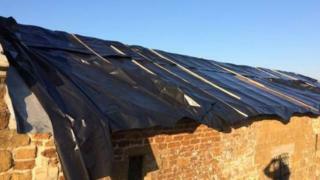 Lead has been stolen from the roofs of five churches in Leicestershire in the space of four weeks. The latest was the 14th Century St Leonard's Church in Holwell, on Thursday, with thieves getting away with "a few tonnes" of lead. It is estimated that about £20,000 of damage has been caused. Leicestershire Police said they have also been investigating thefts at Thorpe Arnold, Ab Kettleby, Plungar and Goadby Marwood, since 5 February. Roger Tucker, churchwarden of St Leonard's Church, said: "There are 6in divots in the ground where the lead hit the grass. "We were in the process of having a burglar alarm installed but the thieves just got there too quickly." St Denys Church, in Goadby Marwood, was targeted on 24 February, only months after the roof had been repaired. New work could cost about £100,000, the church has said. Police are investigating all the thefts but no arrests have been made. The force has appealed for the public's help in reporting anyone acting in a suspicious manner near churches, or buildings in rural areas. On 6 February, the metal was stolen from the south aisle roof of St James Church in Ab Kettleby. Also on 6 February, lead was taken from St Mary's Church in Thorpe Arnold. St Helen's Church in Plungar was targeted on the 6 or 7 February. On 24 February, St Denys Church in Goadby Marwood reported its lead being stolen.